Mostly Positive (121) - 79% of the 121 user reviews for this game are positive. December version introduces a new ironman mode "Surrounded by Traitors" which makes maintaining loyalty of imperial officials much more tricky. Especially over time since the loyalty degrades more when time passes when this ironman mode is selected. This version also introduces a new event related to loyalty and interface improvements. - [feature] Ironman mode: Surrounded by Traitors. Every 100 turns starting Loyalty of new imperial officials (courtiers, governors, officers) is reduced by -1 (up to -5), except political officers who are unaffected. Much higher chance for "Loyalty decreased" event. "Loyalty increased" event will never happen. - [feature] New very rare event "Loyalty decreased". Each imperial official has 50% chance for Loyalty -1. Note that this event is much more frequent if Surrounded by Traitors ironmode is selected. - [interface] Summary of governors/courtiers/officers on Empire/Summary screen now also displays average competence/loyalty/corruption. - [interface] Additional accessories for imperial officials portraits (more earrings for females and a new data visor for males). Note that with old saves you might have some existing portraits changed and might see some odd overrepresentation of certain accessories, it's just a cosmetic thing and affects old saves only. - [interface] Increased chance for accessories for female portraits. - [interface] Reverted back to the old faction icons (while the new ones were more sharp and visible, I have to agree with some concerns raised on the forum that the old more blurry ones are more consistent with the style of portraits and since factions icons are displayed mostly on portraits making them look good with portraits is a priority, plus the imperial eagle which is displayed on governors portrait is a blurred one, so I suppose it's more consistent to make all over portrait icons with blurred versions). - [feature] Native alien population provide bonus to Farms and Mines output proportional to the number of natives. - [feature] Advanced Customization option for extra native alien population. - [balance] Presence of native population chance and quantity redone. Natives are never present on Terra (since Terrans are the original natives of this planet). Never on Barren and Lava, unlikely on Ice. Abundant (both chance and quantity of natives) on Jungle, Swamp, Terran planet types. Note this does not affect old saves since native population is generated on game start. 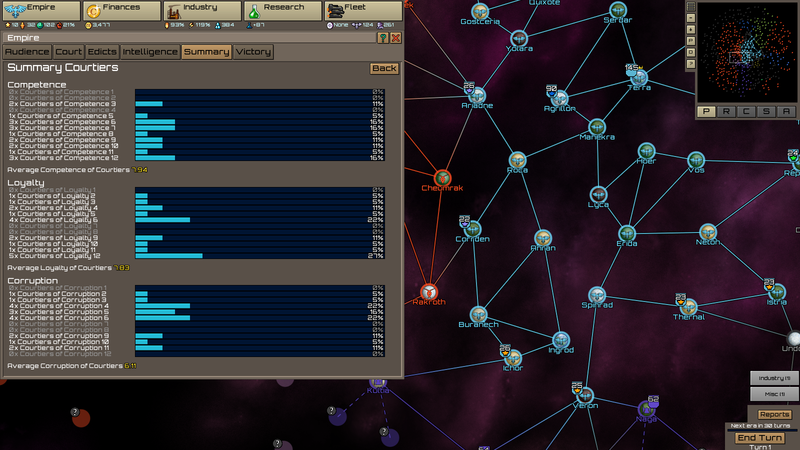 - [balance] Overall native population is more abundant in the galaxy. Note this does not affect old saves since native population is generated on game start. - [interface] Faction symbols replaced with hand crafted pixel perfect art. - [interface] Population icons (Terran, Civilized Aliens, Hostile Aliens, Natives) redone. Now it shows "heads" and overall is more intuitive (hostile aliens not only are marked red but also have vicious faces which should incite your natural urge to exterminate them on sight which is consistent with game effects :D). Also done used pixel perfect art. - [interface] Interface elements (scroller, close, help) adjusted. - [interface] Improved population display on planets (no 0m Terrans listed if there are no Terrans, which means a less cluttered interface). 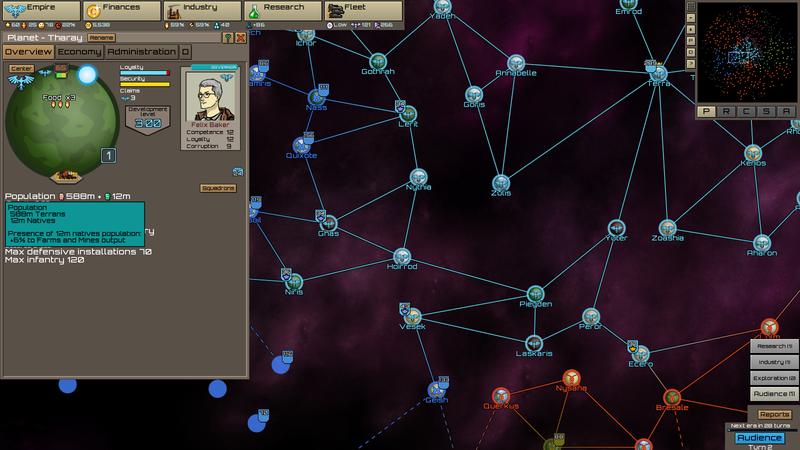 Turn based, 4X, empire space builder, singleplayer, asymmetric, Emperor focused grand strategy. You are the emperor, not a logistics officer. You don't deal with low level stuff like building farms, factories or individual ships. Instead you focus on the grander scale of things. You grant audiences, make edicts, appoint imperial officials, deal with court factions and assassins, crush rebels, decide on production quotas and priorities. In short it's a fast paced turn based space empire builder with no micromanagement, asymmetric mechanics, and focus on you as the emperor. Additional Notes: The game should run on almost any hardware, even outdated one. In case of problems run "safe" mode version. Additional Notes: In case of problems run "safe" mode version.